by George L. Simpson, Jr. Recent years have witnessed the rise of irregular but frequently intensive opposition to U.S. global preeminence by Russia and China. In their own ways, and in pursuit of their own interests, each of these authoritarian governments has established an informal alliance with the Islamic Republic of Iran. For its part, the Khamenei regime in Tehran continues to view the United States as the "Great Satan" and works against American interests by engaging in international terrorism, aiding in attacks on U.S. and coalition personnel in Iraq and Afghanistan, working to derail any resolution of the Israeli-Palestinian dispute, and most of all by seeking to acquire nuclear weapons. 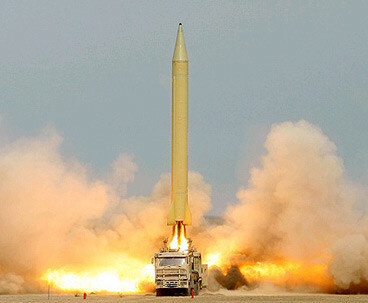 Iran tests a Shahab-3 missile in November 2006. Currently, the Iranian military is trying to develop the Shahab-6 missile, which will have a range of 3,500 miles, putting Europe within its sights. There is some speculation that Moscow is helping Tehran with a missile that will have a 6,300-mile range, enabling it to reach the eastern seaboard of the United States. There is a long history of conflict between Russia and Iran, so why is Moscow now warmly regarded by the Islamist regime, and why does Moscow, in turn, court Tehran? Furthermore, what explains Iran's new alliance with China? Has a new axis, opposed to the United States and Europe, formed, and if so, what are its roots and ramifications? Russian commentator Andrei Volnov has called the de facto Moscow-Beijing-Tehran alignment "a new geostrategic axis." While such a characterization is more metaphor than reality, a trilateral combination, based on the common goals of promoting economic self-interest and reducing U.S. influence, certainly has been built on the foundations of fairly recent but significant bilateral ties between the two countries and Tehran. Thus, Ariel Cohen, a senior research fellow at the Heritage Foundation, notes that Moscow's ties with the Iranian regime "reflect a geopolitical agenda which is at least twenty years old." Russia is engaged in what might be called "strategic opportunism" as it constantly fishes in troubled waters with the goal of identifying vulnerabilities that its policy makers can exploit. Similarly, one can trace Beijing's increasing links with Tehran to the first years of the Iran-Iraq war in the early 1980s. For its part, Iran has followed a consistent anti-America and anti-Israel path since its 1979 revolution. Proponents of an informal alliance from the Russian Federation, China, and Iran present it as a reaction to the unilateralism of the United States and alleged U.S. aspirations for global hegemony. They consider the United States a significant rival and a threat to their long-term security. Consequently, Russia's goal, according to Cohen, is to engage in a "balancing strategy" that will knock the United States down a notch and thus revise the international status quo. While Cohen makes this point for Moscow's policy, it is an equally apt characterization of Beijing's approach as well. The leaders of China and Iran feel that they are the proud heirs to two great and ancient civilizations that have been humiliated and made victims of Western imperial aggression. They believe that Washington's "hegemonism" represents the unjust continuation of long-standing Western efforts to keep them weak and subordinate. Hence, Sino-Iranian relations are bound by what Asia and Middle East analyst John Calabrese calls a "kinship of nationalisms." Perhaps more importantly, an understanding of economic issues further explains China's lukewarm support for the United States in its disputes with Iran. China, which has one of the world's fastest growing economies and which has designs on becoming an economic superpower, is today the world's second largest consumer of oil. Nearly 60 percent of its oil is imported from the Middle East. Iran, which possesses about 10 percent of the world's proven petroleum reserves, replaced Saudi Arabia as the leading supplier of oil to China in May 2009. Indeed, since reaching an agreement in October 2004, Beijing and Tehran have penned energy deals that purportedly are worth more than US$120 billion. Furthermore, Iran's oil producing facilities and equipment are in serious need of modernization. Beijing's willingness to invest in this vital sector of the Iranian economy (as much as 90 percent of Iran's export income comes from oil) is crucial to the fiscal well-being of the present Islamist regime, which, according to official estimates, faces an 11 percent unemployment rate and inflation exceeding 13 percent. Thus, the China National Petroleum Corporation, China's largest oil producer and supplier, signed a deal in January 2007 worth $3.6 billion to develop Iranian offshore gas fields. As recently as June 2009, the same company put its name to a $2 billion contract for development of the northern section of Iran's Azadegan oil field near Ahvaz. Despite U.S. pressure to keep Iran economically isolated, China has leaped into the void created by U.S. sanctions against the Islamic Republic since its 1979 revolution. In 2003, trade between the People's Republic and Iran reached a record $4 billion, and that figure soared to $16 billion in 2006 and $29 billion in 2008. Crude oil constitutes 80 percent of China's imports from the Islamic Republic with mineral and chemical products making up most of the remainder. Beijing's exports are more diversified, with machinery, electrical appliances, textiles, vehicles, and aircraft comprising the most important commodities in demand from Iran. Before 1997, Beijing had, for more than a decade, been Iran's most important partner in helping the Islamist regime develop its nuclear capability. As China expert John W. Garver writes, China's cooperation with Iran "was extensive, sustained over a fairly long period, and of crucial importance to Iran's nuclear effort." The Chinese have apparently retreated from their policy of direct cooperation with the mullahs on the nuclear front since that time. One might think that the long history of conflict between Russia and Persia would preclude Iran from seeking Russian aid. As far back as Peter the Great (r.1682-1725), tsars and tsarinas have nibbled at Iranian borders in the Caucasus and the Caspian region. Over time, first the Romanovs, then the communists intervened more and more in Persian affairs, with the latter going so far as to establish short-lived "People's Republics" in Kurdish and Azeri regions of Iran. Despite this, the courtship continues. Russia also has economic reasons to back the Tehran regime. Russia's trade with Iran is more modest than China's but nevertheless significant. Total trade between the two countries equaled $3.2 billion in 2008 with analysts predicting even higher numbers within a few years. As both countries are major energy producers, they share a common interest in establishing pricing policies for oil and natural gas as well as manipulating these markets to their advantage. More significant, however, is Moscow's role in the Islamic Republic's nuclear program. The Russian government has assisted in Iran's construction of the $800 million Bushehr nuclear power plant and has helped the mullahs obtain nuclear knowledge. As a result, Moscow, as well as Beijing, is at odds with Washington over how to deal with Tehran's efforts to gain a nuclear capability. China and Russia, both of which wield veto power on the United Nations Security Council, have consistently obstructed efforts in the U.N. to halt Tehran's drive to obtain nuclear weapons. While it is true that from time to time, both countries have called on Iran's regime (which is a signatory to the Nuclear Non-proliferation Treaty) to cooperate with the International Atomic Energy Agency (IAEA), neither has supported effective sanctions or forceful measures to deal with the problem. Gennady Yevstafyev, a senior adviser at the Center for Policy Studies in Russia, has gone so far as to contend that "Washington closed its eyes to the creation of nuclear weapons by its strategic partner, Pakistan. But now it is threatening a war on its ex-strategic partner Iran for the same crime." Moscow continues to talk out of both sides of its mouth. Sergei Kiryienko, the director-general of Rosatom, Russia's federal atomic energy agency, has stated the official Russian position that "broad access to civilian nuclear power must be guaranteed while at the same time there must be a guarantee that weapons of mass destruction will not proliferate under any circumstances." As recently as October 2007, then-president Vladimir Putin described a nuclear armed Iran to be a "strategic threat" to Russia when he met with leaders of the European Jewish Congress and with French president Nicolas Sarkozy in Moscow. Yet the Russian leader went on to claim that there was no "objective data" proving that Iran was seeking nuclear weapons so that "we proceed from a position that Iran has no such plans." What lies behind the inscrutable strongman's thinking is difficult to say for certain, but one can speculate that Putin's antipathy towards the United States as well as his desire to conciliate cronies within the Russian Federation's military-industrial complex goes a long way to explain this gamble. Arms sales to Iran by China and Russia, which the three countries insist are lawful, is another source of contention between the latter two and Washington. Russia is Iran's biggest weapons supplier by a wide margin, though China is also an important source. Russia reportedly supports the Islamic Republic's development of ballistic missiles, which former Secretary of State Colin Powell warns have been redesigned to enable them to carry nuclear warheads. Currently, the Iranian military is trying to develop the Shahab-6 missile, a variant of the North Korean Taep'o-dong-2C/3, which will have a range of 3,500 miles, putting Europe within its sights. There are unverified reports that the Russians have transferred rocket engine technology for this program and even some speculation that Moscow is helping Tehran with a missile that will have a 6,300-mile range, enabling it to reach the eastern seaboard of the United States. For its part, although the Chinese government denies as "groundless allegation[s]" reports about its role in supplying Iran with weaponry, it is clear that it has transferred missile components and technology to Iran since the 1980s. For example, Tehran has obtained Chinese-made anti-ship surface-to-surface C-801 and C-802 missiles, which pose a potential threat to Persian Gulf shipping and U.S. naval vessels in the region.. According to the CIA and experts in the field, Iran is also trying to develop sophisticated biological and chemical weapons. These efforts go back to the Iran-Iraq war when the Iranians were on the receiving end of Iraqi chemical attacks. Although Iran has ratified the Biological Weapons Convention, specialists believe that with the help of Russian experts, it is "in the advanced research and development phase" of weaponizing chemical toxins and living organisms. For its part, China has helped in Iran's acquisition of weapons of mass destruction by selling precursor and dual-use chemicals, as well as the technology and equipment needed to use them. Thus there is good reason to conclude that "the Iranian leadership intends to maintain a robust CW [chemical weapons] capability." Washington is concerned not just with Iranian possession of sophisticated weapons but with the prospect of Tehran transferring them to terrorist proxies, such as Lebanese-based Hezbollah. In fact, the group launched an Iranian C-802 missile during the 2006 Israel-Hezbollah war, which hit the Israeli missile frigate Hanit. According to Israeli press reports, the mullahs are currently supplying Iranian-made Zelzal and upgraded Fateh-110 surface-to-surface missiles to the radical Shi'i group. In August 2009, Israeli president Shimon Peres claimed that Hezbollah currently had 80,000 Iranian-supplied missiles. While neither Moscow nor Beijing is directly responsible for these developments, neither appears particularly concerned when the weapons or technologies they transfer to Iran find their way into the hands of terrorist organizations. Finally, both Moscow and Beijing are aiding the Iranian military as it develops advanced conventional weapons. Despite Washington's strong objections, by late 2006, the Russia government had sold and begun delivery to Tehran of twenty-nine of its Tor-M1 air defense systems. Moscow argues that the $700 million sale is totally legal and asserts that these are "defensive" weapons. Iran's acquisition of such a sophisticated and advanced system poses a threat to any potential U.S. or Israeli air attack to take out Tehran's nuclear facilities. Iran has also acquired at least ten Russian-made Pantsyr-S1E self-propelled short-range gun and missile air defense systems from Syria. In March 2007, the Russian investigative journalist Ivan Safronov died mysteriously after learning that Moscow's military-industrial complex was planning to transfer S-300VB missiles to Iran via Belarus. These are Russia's equivalent to the U.S.'s Patriot missiles: The S-300VB is capable of intercepting ballistic missiles and has a range of 150 kilometers. As of this writing, it appears that Iran has not received the weapons, but Iranian officials are eager to do so. There are numerous reports that Russia and China have also covertly sold Iran an array of surface-to-air missiles (SAMs), combat aircraft, sophisticated radar systems, and fast-attack missile vessels. Some of the SAMs have apparently made their way to insurgents fighting coalition forces in Iraq. Sources also claim that either China or Kyrgyzstan has sold the Iranians high-speed torpedoes originally produced by the Russians. Recent events demonstrate the complexities of the evolving relationship between Tehran and its great-power allies. Over the summer of 2009, there were mixed signals coming from Russia and Iran concerning bilateral ties. In June, following the upheavals in Iran over that country's disputed presidential elections, Russian president Dmitry Medvedev cancelled, because of alleged scheduling conflicts, a planned meeting with Iranian president Mahmoud Ahmadinejad at a gathering of the Shanghai Cooperation Organization (SCO), a mutual-security organization comprising China, Kazakhstan, Kyrgyzstan, Russia, Tajikistan, and Uzbekistan. Iran has observer status with the multinational group and aspires to become a full member, but the Russians have not gone out of their way to make this happen. In August 2009, Russia joined with Pakistan, Afghanistan, and Tajikistan in a four-party regional summit to which Iran was not invited. At that time, the Nezavisimaya Gazeta, a journal whose views sometimes reflect those of the Kremlin, editorialized, "It appears that the idea that Iran is a regional power, which Russia could use as a trump card in relations with the West, has turned out to be mistaken." It would appear that at least some in the upper echelons of the Russian government doubted the wisdom of continuing support to Tehran following the disputed election and the international opprobrium directed against the mullahs as they suppressed subsequent dissent. For their part, at least some Iranians took note of this chilly behavior. An editorial in the "moderate" Iranian newspaper E'temad, which serves as the mouthpiece for Mehdi Karroubi's oppositional National Trust Party, complained that Moscow had not helped Iran in the United Nations with its "peaceful pursuit" of nuclear energy as much as it could, and that it was dragging its feet in getting the Bushehr nuclear facility up and running. The article concludes, "Russians cheat their allies if it is necessary, and history shows that they have swindled us heavily." At the same time, other Russian officials have acted as if it were business as usual between Moscow and Tehran. Moreover, supporters of this approach seem to have had the final say in the Kremlin. Two days after what was viewed by most outside observers as a fraudulent vote, newly "reelected" Iranian president Ahmadinejad made his first foreign trip to Russia. Russian deputy foreign minister Sergei Ryabkov called the visit "symbolic" and added, "This is a signal of successful mutual relations in the future." Shortly thereafter, Russian foreign minister Sergei Lavrov referred to the Iranian elections as "an exercise in democracy." I do not believe sanctions are the best way to achieve results. Sanctions were used on a number of occasions against Iran, but we have doubts about the results. Nevertheless, when all instruments have been used and failed, one can use international legal sanctions. … I think we should continue to promote positive incentives for Iran and at the same time push it to make all its programs transparent and open. Should we fail in that case, we'll consider other options. Medvedev's statement offers no clear sense of what might prompt the Russians to wield a stick against the mullahs. Moreover, one must still wonder whether former president Putin, the real power behind the throne, would agree to such a policy. Notwithstanding Moscow's concurrence with an October 2009 IAEA compromise for Iran to send most of its enriched uranium abroad to be processed into reactor fuel, there seems to have been no Russian reaction to Tehran's failure to respond to President Obama's December 31, 2009 deadline regarding the offer. It is hard to imagine that Moscow will support any but modest penalties to be imposed against Tehran. Indeed, as recently as January 2010, Russian foreign minister Lavrov said that "acting with a logic of punishing Iran … is not a sober approach." On the surface, the Kremlin has apparently joined with the United States, Great Britain, France, and Germany in pursuing the so-called "two track" policy of threatening Iran with sanctions while still dangling the carrot of dialogue. On February 5, 2010, Lavrov met with his German counterpart Guido Westerwelle in Berlin and afterwards told reporters that "if we do not see a constructive answer from Iran, we will have to discuss this in the U.N. Security Council." Yet, the Russian foreign minister went on to say that he was still hopeful of a diplomatic solution to the nuclear issue. The question remains, however, whether Moscow will let go of the carrot and, even if it does, whether it would ever support more than a slap on Tehran's wrist. Basing one's appraisal of Russian intentions on experience rather than hope, one is inclined to agree with the conclusion of Ray Takeyh, senior fellow for Middle Eastern studies at the Council on Foreign Relations, and Nicholas Gvosdev, adjunct senior fellow at the Nixon Center: "Russia is not interested in playing an active role in resolving the Iran crisis on terms America will find acceptable." Tehran's ties with Beijing appear even stronger than those it has with Moscow. Chinese president Hu Jintao had even fewer scruples than his Russian counterpart in the wake of the fraudulent Iranian election. Days after the disputed vote, he shook hands with Ahmadinejad as Xinhua, China's state-run news agency, reported on the "sound momentum" of bilateral relations. When the Chinese media actually did report on the post-election disturbances in the streets of Tehran, they were attributed to "vandals" and "terrorists," and Chinese television viewers were shown no images of Iranian security forces brutalizing protesters. Still, Wu Sike, China's special envoy to the Middle East, maintains that Beijing opposes Iran's production and possession of nuclear weapons. The problem is that while he avers that China's policies have not changed on this issue, he and his superiors appear to see no urgency in acting to stop it. China does not, however, offer a strictly one-sided backing for all of Iran's aspirations. In 2008, China's Hu Jintao officially "welcomed Iran's interest to join the Shanghai Cooperation Organization (SCO), saying an expert committee will be formed to consider the proposal." Yet little progress has been evident thus far; Iran sent a representative to the SCO secretariat in Beijing in January 2010 to discuss how it might further its interaction with the organization but remains an observer state. On the nuclear issue, Beijing also appears intent on opposing sanctions. Thus, in early September 2009, China's Foreign Ministry declared that "under current circumstances, we must increase diplomatic efforts and renew talks with Iran." Although there was some hope that Vice President Joseph Biden's September 11, 2009 meeting with Wu Bangguo, China's second most powerful leader, would have changed this response, such has not been the result. Indeed, shortly thereafter, a Chinese Foreign Ministry spokesperson gave Beijing's response to the revelation about Iran's covert nuclear facility: "We believe that sanctions and exerting pressure are not the way to solve problems and are not conducive for the current diplomatic efforts on the Iran nuclear issue." While French prime minister Francois Fillon has since asserted that his country and China "share identical views on how to lead Iran away from its threatening stance and isolation on the nuclear issue," no such declaration has been forthcoming from Beijing. In fact, the opposite is true. In January 2010, China, France, Germany, Great Britain, Russia, and the United States gathered in New York to focus on the issue of Iran's nuclear program. Beijing, however, sent a low-level diplomat to the meeting in what observers considered a snub to the others. The Chinese representative explained that his country was only prepared to begin discussing the possibility of imposing sanctions. At this point, it would seem that optimism regarding China's coming around to support effective sanctions is reminiscent of Samuel Johnson's estimation of second marriages as "the triumph of hope over experience." The most imminent threat to the global order comes from the radical Islamic regime in Iran bent on developing nuclear weapons. Both Russia and China have consistently supported Tehran by their aggressive, opportunist—and shortsighted—policies, and both are in large measure responsible for the threat that the Iranian government poses to the world today. Should the radicals in Tehran obtain the ability to launch ballistic missiles with warheads on them, there is no guarantee that one day they might not target Russian cities or other objectives. China, too, might ultimately find itself in the sights of an unfriendly regime in Iran. Should a military conflagration occur in the Persian Gulf and curtail the flow of oil from the region, it would surely spell disaster for the Chinese economy. With its vast supplies of oil and natural gas, Moscow might reap windfall profits, but there is no guarantee of where the chain reaction of a Middle East war might stop. A radical Shi'i Iranian regime armed with nuclear weapons would likely lead to proliferation among other states in the area such as Saudi Arabia, Turkey, and Egypt. The stakes are high and getting higher. Indeed, those who have decided to back Tehran should consider how a nuclear Iran will promote their security interests. The opaqueness of decision-making in the Kremlin makes it difficult to explain fully Moscow's behavior in abetting the Iranian regime, but it would seem that the temptation of making a fast ruble and undermining Washington in the bargain is just too much for those in power to resist. Likewise, both China's economic imperatives and its desire to become the next great superpower on the world stage likely play a decisive role in its behavior. Russian and Chinese posturing that they have sought peace and stability in the region through constructive dialogue has been a façade. The occasional snubs from Russia following the 2009 sham election or expressions of discomfort from both countries over Iran's covert nuclear program seem little more than public relations stunts. The two authoritarian regimes have consistently undermined the United States in its efforts to contain Iran and have profited by doing so. Indeed, if the leaderships in Moscow and Beijing continue to sabotage diplomatic efforts to halt the clerical regime's drive for nuclear weapons, they should be held accountable by Washington and the international community for obstructing nonviolent remedies to the Iranian problem. U.S. officials could launch a concerted public relations campaign to demonstrate to the world the depth of the Russian and Chinese culpability in creating a problem that threatens the stability of a vital geopolitical part of the world. Washington might press the restart button on its plan to provide missile defense systems in central Europe or increase its military cooperation with Taiwan. Additionally, as trade is a two-way proposition, the Russians and Chinese could encounter a host of difficulties in this sphere as well. Unless they change their course immediately, it is they who will carry the onus for a U.S. or Israeli recourse to military intervention in order to prevent a nuclear-armed Iran. It may seem hard to imagine the present administration in Washington taking such action, but it is also unclear what Jerusalem will do. An Israeli strike against Iran would likely result in a serious setback to Tehran's nuclear program, but its certainty of success is by no means guaranteed. Moreover, Israel would pay a heavy diplomatic price for what would no doubt be termed its "reckless adventurism." Thus, it hesitates, and if it does so for too long, one should not be at all surprised if Israel or some other country ends up being the innocent victim of a nuclear power that the Russians and Chinese will have helped to create. While there may not be a new axis in a formal sense, the combination of Moscow, Beijing, and Tehran on a range of issues has undermined the security of the Persian Gulf region and worked against the interests of the United States and its allies. Its potential continuation represents a broader and more fundamental threat to global stability, would likely destroy decades of diplomacy, and sound the death knell of the nonproliferation regime. George L. Simpson, Jr., is professor and chair of the history department at High Point University. Ely Karmon, "Counterterrorism Policy: Why Tehran Starts and Stops Terrorism," Middle East Quarterly, Dec. 1998, pp. 35-44. Jonathan Schanzer, "Ansar al-Islam: Back in Iraq," Middle East Quarterly, Winter 2004, pp. 41-50. Gen. David H. Petraeus, commander U.S. Central Command, testimony before the Senate Armed Services Committee on the Afghanistan-Pakistan Strategic Review and the Posture of Central Command, Apr. 1, 2009. Elihu D. Richter and Alex Barnea, "Tehran's Genocidal Incitement against Israel," Middle East Quarterly, Summer 2009, pp. 45-51. Rossiiskie Vesti (Moscow), Russian Federation, June 23, 2005. Ariel Cohen, "The Russian Handicap to U.S. Iran Policy," Jerusalem Issue Briefs, Apr. 22, 2009. Steven Rosefielde and Stefan Hedlund, Russia since1980 (Cambridge: Cambridge University Press, 2009), pp. 211-30. John W. Garver, China and Iran: Ancient Partners in a Post-Imperial World (Seattle: University of Washington Press, 2006), pp. 71-82. Cohen, "The Russian Handicap to U.S. Iran Policy." Garver, China and Iran, p. 5. John Calabrese, "China and Iran: Partners Perfectly Mismatched," Middle East Institute, Aug. 18, 2006. Ilan Berman, "The Logic behind Sino-Iranian Cooperation," China and Eurasia Forum Quarterly, Nov. 2006, pp. 15-23; "Fueling the Dragon: China's Race into the Oil Market," Institute for the Analysis of Global Security, Potomac, Md., accessed Dec. 28, 2009. Tehran Times, Jan. 6, 12, 2010. United Press International, June 12, 2009. Asia Times (Hong Kong), Nov. 29, 2004; China Daily (Beijing), Feb. 18, 2008; The Guardian (London), June 22, 2009; Canberra (Aus.) Times, Nov. 12, 2007; Tehran Times, May 11, 2009. Garver, China and Iran, p. 247. "Weapons of Mass Destruction: Bushehr-Background," GlobalSecurity.org, accessed Dec. 28, 2009. United Press International, June 6, 2006. Barbara Slavin, Bitter Friends, Bosom Enemies: Iran, the U.S., and the Twisted Path to Confrontation (New York: St. Martins Press, 2006), p. 29. BBC News, Oct. 10, 2007. Fars News Agency (Tehran), May 9, 2009. The Washington Post, Nov. 17, 2004. Charles P. Vick, "Weapons of Mass Destruction: Shahab-6," GlobalSecurity.org, Jan. 26, 2009. Xinhua General News Service, June 16, 2006. "Unclassified Report to Congress, January–June 2003," Central Intelligence Agency, Washington, D.C., Apr. 30, 2007; Garver, China and Iran, pp. 182-9, 213-4. "C-801 YJ-1/YJ-8 (Eagle Strike), CSS-N-4 SARDINE," Military Analysis Network, Federation of American Scientists, Aug. 10, 1999; Reuters, Jan. 19, 2010. Agence France-Presse, Sept. 14, 2006. "Weapons of Mass Destruction: Biological Weapons," GlobalSecurity.org, Apr. 28, 2005. "Weapons of Mass Destruction: Chemical Weapons," GlobalSecurity.org, Oct. 15, 2008; Ronen Bergman, The Secret War with Iran: The 30-Year Clandestine Struggle against the World's Most Dangerous Terrorist Power (New York: Free Press, Sept. 2008), p. 313. "Din vecheshbon chelki," HaVaadah Livdikat Eiru'ei haMa'arachah beLevanon 2006 vaadat Winograd, MyNet.co.il, Apr. 2007. "Zelzal-1/2/3," MISSILETHREAT.com, Claremont (Calif.) Institute, accessed Jan. 25, 2010; The New York Times, July 9, 2008. Al-Manar TV (Beirut), Aug. 22, 2009. Jareer Elass and Amy Myers Jaffe, The History and Politics of Russia's Relations with OPEC (Houston: James A Baker, III, institute for Public Policy, Rice University, May 6, 2009), p. 31. Defense Industry Daily (Thetford Ctr., Vt.), Dec. 5, 2005; Pravda (Moscow), Dec. 1, 2007. Agence France-Presse, May 21, 2007. The Washington Post, Mar. 6, 2007. The Times (London), Sept. 19, 2008; The Guardian, Sept. 8, 2009. Tehran Times, Jan. 18, 2010. Gill Bates and Evan S. Medeiros, "Foreign and Domestic Influences on China's Arms Control and Nonproliferation Policies," The China Quarterly, Mar. 2000, pp. 74-9; Kenneth Katzman, "Iran: Arms and Technology Acquisitions," Congressional Research Service, Washington, D.C., Jan. 26, 2001; "Iran Missile Milestones," IranWatch.org, Jan. 2010, accessed Feb. 7, 2010; "Thondar Fast Attack Missile Boat," GlobalSecurity.org, accessed Feb. 7, 2010. Rear Adm. Mark I. Fox, Communications Division chief for Multi-National Force-Iraq, and Brig. Gen. Mark Gurganus, Ground Combat Element commander for Multi-National Force-West, news briefing, Baghdad, Sept. 30, 2007. Associated Press Worldstream, Apr. 6, 2006; Bergman, The Secret War with Iran, pp. 294-5. Interfax News Agency (Moscow), June 16, 2009, in BBC Monitoring Former Soviet Union-Political, June 16, 2009. Siyasat-e Rouz (Tehran), Sept. 12, 2009, in BBC Monitoring Middle East-Political, Sept. 27, 2009. Los Angeles Times, Aug. 10, 2009. E'temad (Tehran), Aug. 12, 2009, in BBC Monitoring Middle East-Political, Aug. 29, 2009. The Christian Science Monitor, June 16, 2009. The New York Times, Sept. 10, 2009. CNN News, Sept. 25, 2009. The Guardian, Sept. 26, 2009. Iran Daily (Tehran), Jan. 23, 2010. Ray Takeyh and Nicholas Gvosdev, "The Russian Riddle II: Russia, the U.S., and Iran," The New York Times, Sept. 8, 2008. China View (New York), June 16, 2009. The Australian (Sydney), June 24, 2009. Ministry of Foreign Affairs of the People's Republic of China, Beijing, Aug. 11, 2009. Tehran Times, Sept. 7, 2008. "SCO Secretary-General receives Iran's Charge d'Affaires to China," Shanghai Cooperation Organisation, Jan. 28, 2010. National Public Radio, Sept. 8, 2009. The Guardian, Sept. 24, 2009. Agence France-Presse, Dec. 22, 2009. The Times, Jan. 16, 2010. The Times, Jan. 18, 2010. Related Topics: China, Iran, Russia/Soviet Union | Spring 2010 MEQ receive the latest by email: subscribe to the free mef mailing list This text may be reposted or forwarded so long as it is presented as an integral whole with complete and accurate information provided about its author, date, place of publication, and original URL.